I'm going away on holiday tomorrow afternoon, so I'm doing my Lammas ritual early. Here is my altar set up with the candles, candle holder, cloth and other things from the latest Wheel of the Year box from Wicca Moon. The ritual that comes with the kit is lovely. It is is a personal celebration of our own harvest and the abundance we might have in our lives. For some of us, that will be a harvest of fruit, veg or flowers from our gardens, but for others it might be our achievements in business or creative projects. 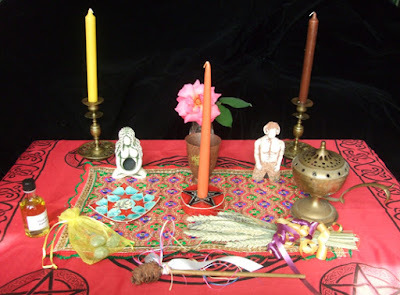 We are encouraged to put things on our altars that reflect anything we want to give thanks for. I picked a rose from my garden, but I am also tempted to add copies of the books I've written, edited or contributed to. The information sheet about Lammas, or Lughanasadha, which comes with the ritual kit also includes instructions for making a corn husk doll. These are traditionally made in parts of Eastern Europe, as well as by some Native American tribes, out of the husks of corn on the cob. Folkloric dolls are very much my interest, but I've not yet had a go at making one out of the husk from a corn on the cob. I might give it a try this summer.